As you approach the Barracuda lake you will be floored by the scenic beauty of the surroundings. There will be few other places in the world that would be as mesmerizing as the Barracuda Lake. The colour of the sea water is brackish for the first 14metres, and the temperature is 28°C. Further down at 38°C it is salty. When you reach the depth of 26 metres the temperature is again about 28°C. As you keep swimming downwards at 32 metres, you will see that the color of the water is like that of tea. This is due to the tannic acid which gets deposited on the sea bed from the leaves. You can also see the thermoclines and you would love to move around there like dolphins do. The mud at the very bottom is as soft as pudding. Try putting in you hand I the mud, and you can manage to get it down till your elbow. For the ones who are more on the adventurous side try headfirst dive. Once you are back home, you can print these never to forget photographs. Yes, as you were wondering about the name, there is a huge Barracuda there. Be careful as it might be chasing you meekly from an advantageous position! The maximum depth is about 30 metres, and the certification needed is Open Water Diver. It is a cave under the Coron Island, Palawan, which is directly connected to the sea. 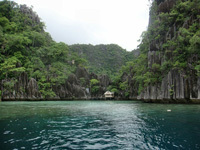 To be more specific about the location, it is on the south end of Coron Island on the East side. Starting as a hole at the bottom of the sea, the gorgeous Cathedral Cave is next to the sheer rock wall of the Coron Island. You have to enter a tunnel and go down upto about 12 metres. As you make your move downwards keep your eyes open, and you would see the antennae of juvenile lobsters waving at you from their dens. They can be anywhere – holes in the tunnel, under the rocks, above the rocks. You can also see cowry shells clinging unto the tunnel ceiling. As you come to the end of the tunnel you would see daylight penetrating in to the cave. The roof of the cave is now smashed due to an oversized tree trunk falling over it. The skeleton of the tree trunk, along with the main branches, still rests on the mound of sand, in the middle of the Cathedral Cave. As you proceed following the light and you reach a huge underground cathedral, from which the cave derives its name. As you go on swimming, the left to another passage will lead you to a chamber with an air pocket above the ocean level. Cathedral Cave is a dive you cannot afford to miss. With 20 to 30 metres of visibility, you can watch some of the amazing corals. 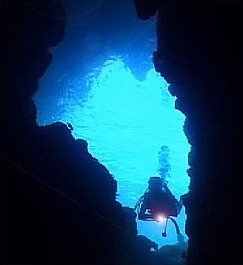 The maximum depth inside the cave is about 10 metres, and recommended certification level is Advanced Open Water Diver, Cavern Diver Speciality.